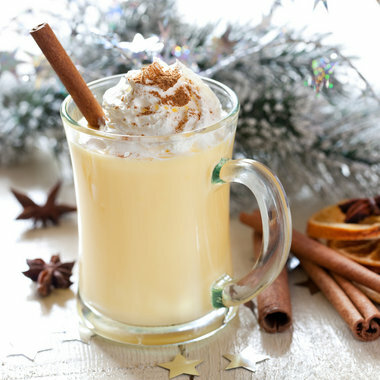 On the third day of Christmas, Drink Matron gave to me: Eggnog Drinks! You can’t have Christmas without eggnog. Sure, you could go out and buy some, but why when you could make it from scratch, or better yet, get your mom to make it from scratch for you? That way, you can add any sort of booze you want! I’ve collected a few recipes that I think you could easily convince Mom (or Dad/sister/brother/aunty/etc) will work for grownups and maybe even kiddos. For kiddos, just don’t add booze. Seriously? Did I have to tell you that? First off, you should have a standard eggnog recipe, in case all you really wanna do it add booze to it and chill on the couch. 1. In a large bowl, use a whisk or an electric mixer to beat egg yolks until they become somewhat lighter in color. Slowly add the sugar, beating after each addition, whisking until fluffy. 2. Combine the milk, cloves, and cinnamon in a thick-bottomed saucepan. Slowly heat on medium heat until the milk mixture is steamy hot, but not boiling. 3. Temper the eggs by slowly adding half of the hot milk mixture into the eggs, whisking constantly while you add the hot mixture. Pour the mixture back intohttp://drink-matron.com/wp-admin/post.php?post=2960&action=edit the saucepan. 4. Cook on medium heat, stirring constantly with a wooden spoon, until the mixture begins to thicken slightly, and coats the back of the spoon. It helps to have a candy thermometer, but not necessary; if you have one, cook until the mixture reaches 160°F. Do not allow the mixture to boil, or it will curdle. (If the mixture does curdle you may be able to save it by running it through a blender.) Remove from heat and stir in the cream. Strain the mixture through a mesh strainer to remove the cloves. Let cool for one hour. 5. Mix in vanilla extract, nutmeg, and bourbon/rum and brandy (Seriously, NOT FOR KIDS. Gees.) Chill. I feel like my friend Kelsey would probably paint her face purple, get drunk on this with her mom, and sit down for a Ravens game. It doesn’t sound fancy, but it looks ladylike in my head. Combine ingredients in a shaker and shake well. Strain into a glass. Sprinkle nutmeg (or purple sprinkles, come on! )on top and serve. *Hey, don’t give this one to the kids. Egg, powdered sugar, and milk is probably not their idea of a good time, ya know? Why not? You are with your family. Combine in a shaker and shake well. Strain into a large glass over ice cubes. Sprinkle with nutmeg, and serve. *It’s your call on the kids with this one. I don’t know what they like. JUST DON’T GIVE THEM BOOZE. Blend brandy, rum, and syrup until smooth and pour into a heat-proof goblet. Add boiling milk, sprinkle with nutmeg and serve. *Not for kids, me thinks. Yeah, this is a thing. My buddy Chris suggested it and then I actually found it online. Don’t make this in bulk. Just don’t. If you’re making it at all it’s because your buddy brought Jager over and thought it would be awesome with eggnog. *Just give the kids eggnog and never tell them about Jagermeister. Whisk together the eggnog, brandy, rum and creme de cacao together in a large punch bowl. Add a large block of ice. Grate a little nutmeg over the top of each drink when serving. Makes 8 (6-ounce) punch cups. *Again, just give the kids some eggnog, sans booze. Note, because of the salmonella risk from raw eggs, it is recommended that children, elderly, and people with compromised immune systems refrain from eating raw eggs such as the optional whipped egg whites in this recipe, unless you use pasteurized eggs. Previous On the second day of Christmas, Drink Matron gave to me: Hot Buttered Rum! Next On the fourth day of Christmas, Drink Matron gave to me: Rum Balls and Cake Pops!